In India, from time immemorial, knowledge-ritual-devotion and action have been blended for a healthy development of an individual’s spiritual progress. 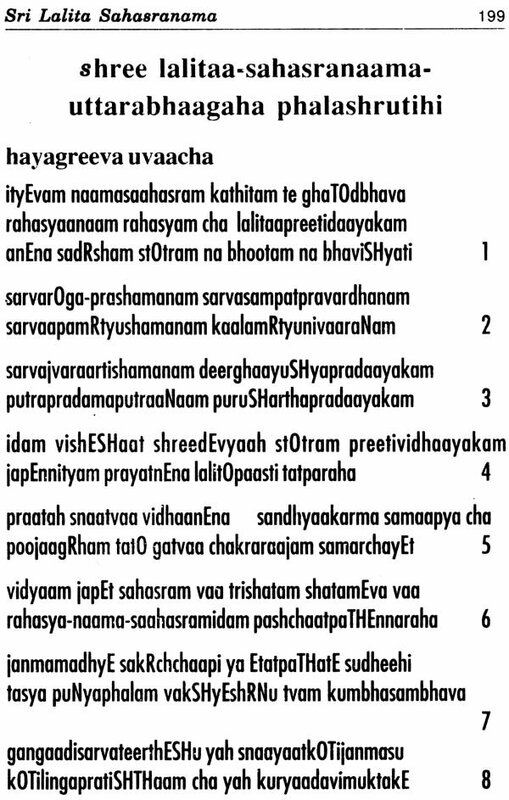 The various hymns of Vedas and puranas stand testimony to this ideal. 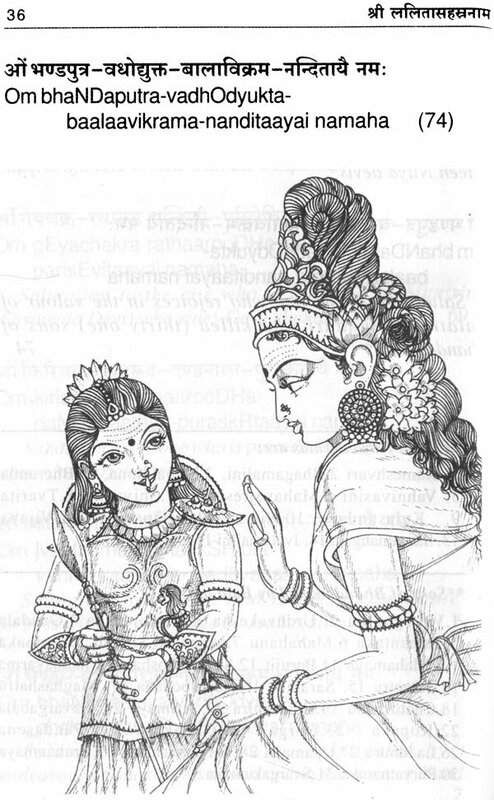 But to derive the full benefit from any practice, it is essential to know what –how and why behind it. 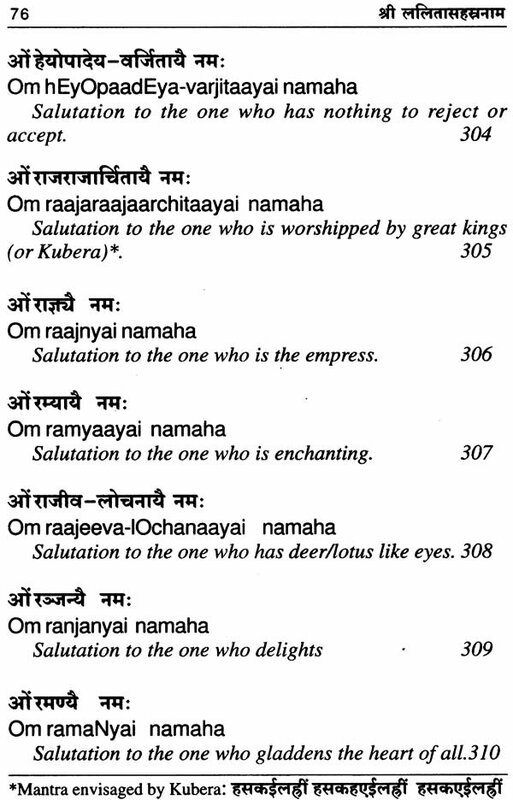 Keeping this in mind, Bhaskararaya, the commentator of lalita sahasranama (LS), emphasizes on the artha-jnyaana i.e., knowledge of the meaning as one of the meaning as one of the essential aspects in deriving full benefit of it. 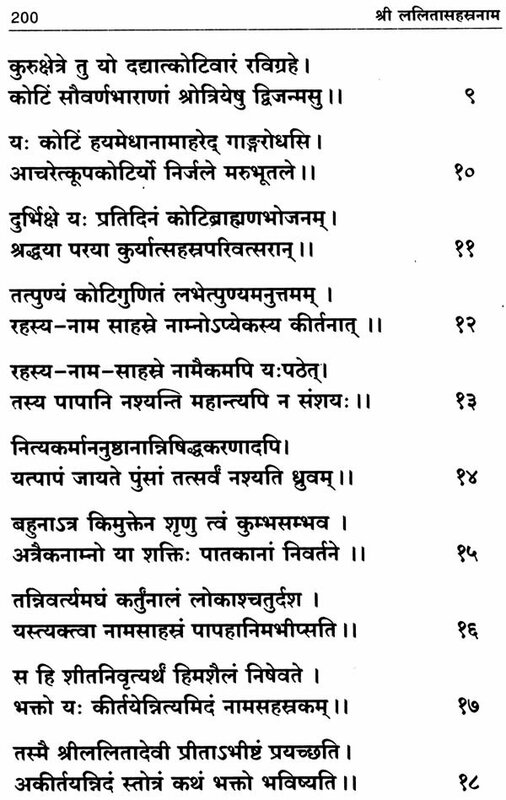 Among various Sahasranama’s LS stands out as crest jewel. 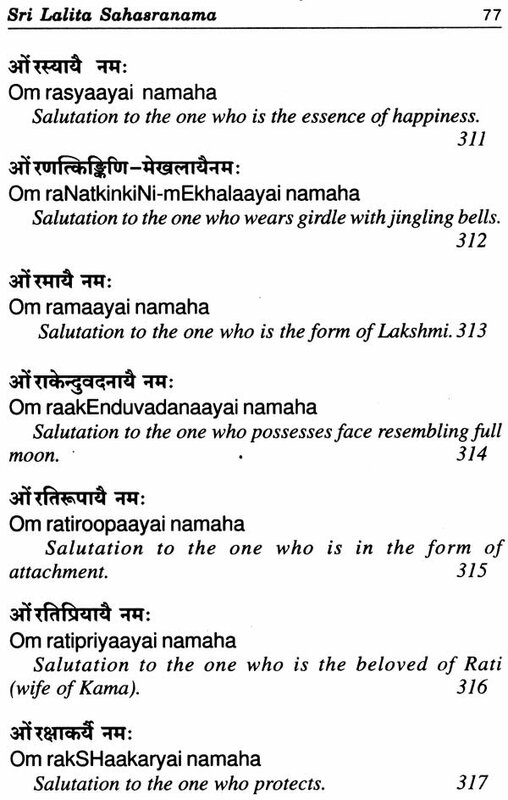 It is called Rahasya nama sahasram, because there are countless secrets pertaining to mantra shastra, Upasana and Brahma-jnyaana hidden under the cloak. While speaking of eligibility of a person in chanting, one must seek the Guru to initiate oneself into this sacred lore and should be pure in thought, speech and deed. 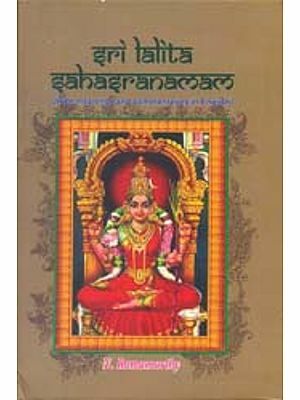 Supremacy of this stotra lies in the fact that this was composed by Vagdevatas at the behest of Mother Lalita Herself and was approved by her in the assembly of celestials . 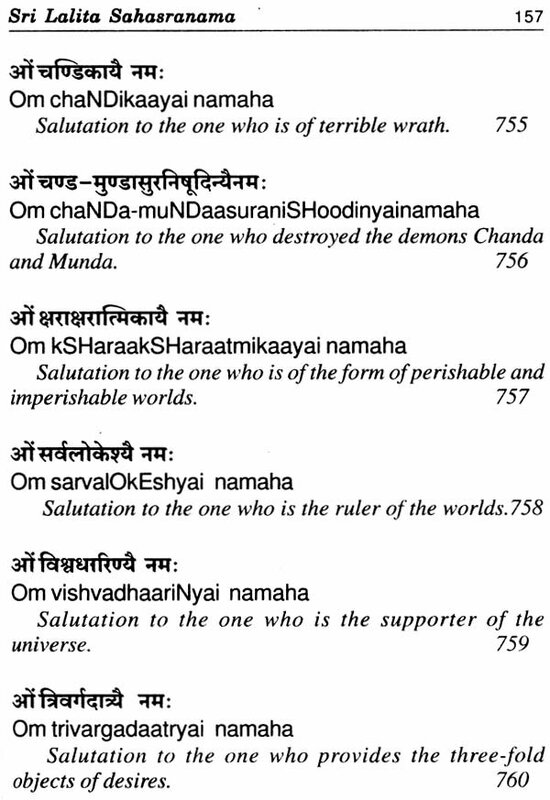 To this word, Lord Hayagriva taught it thought his disciple Sage Agastya. 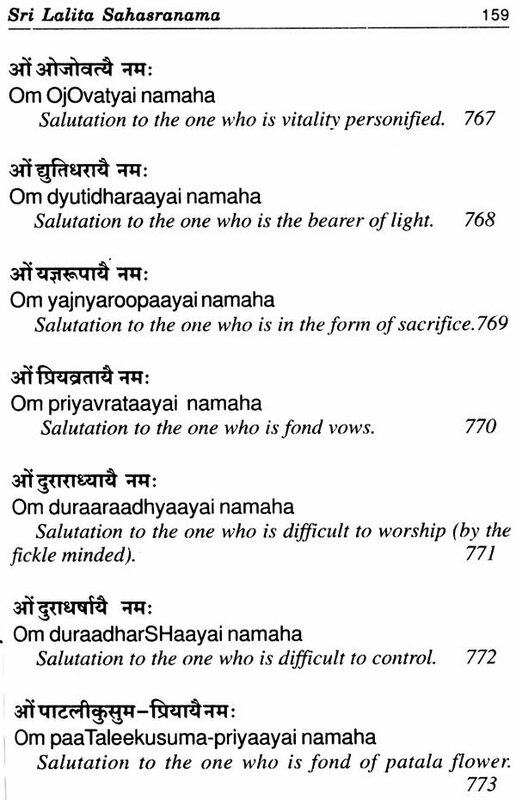 Recitation of LS itself in the naama ‘Stotra priya ‘ and ‘Namaparayanaprita’. 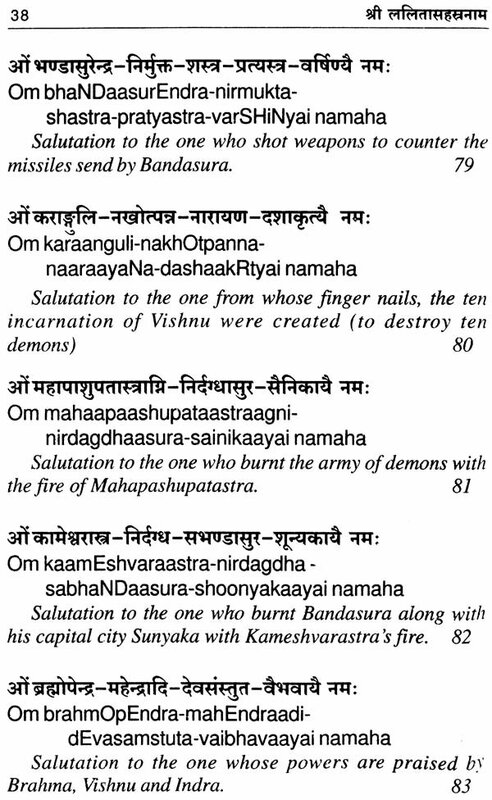 Many commentators have tried their hands in explaining this hymn, but Saubhagyabhaskara by Bhaskaraya stands out as Supreme among them because of his elaborate discussion on Mantrashastra, Upanishadvidya, Grammar, tantric aspects, Kashmir Shaivist philosophy, etc., making it a complete tantric Encyclopedia. 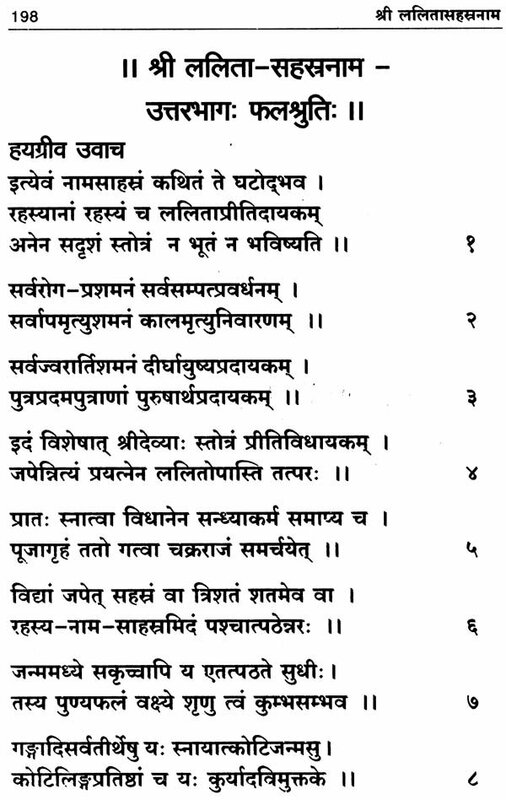 Every time one reads this Stotra, a new enlightenment is bound to dawn. 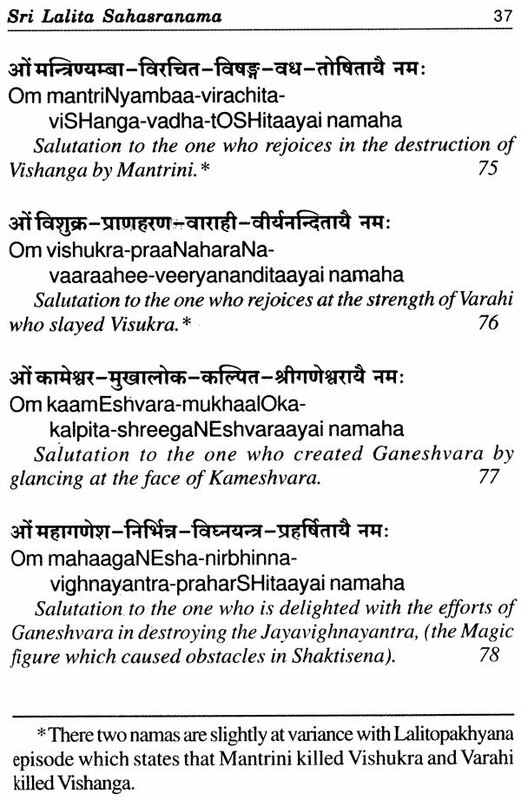 This is the essence of Srividya and recital of LS once may confer the benefit of performing the entire navavarana puja a fact mentioned in the phalashruti. 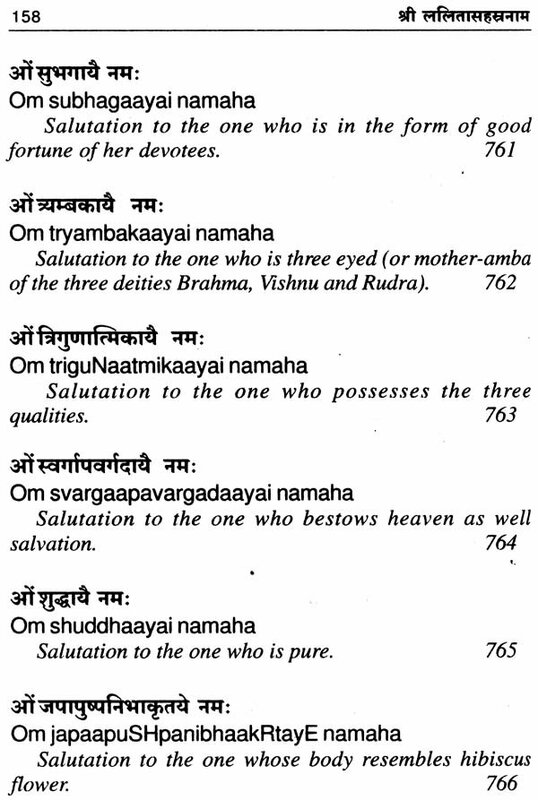 This is not a blind eulogy, but a fact, since all aspects of the avarana puja, right from guruvandana till puja samarpana have a corresponding naama scattered throughout the text. 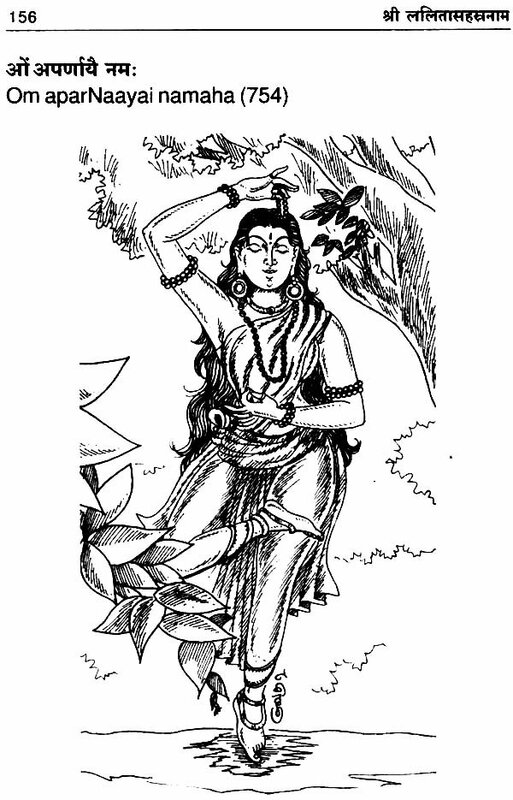 This fact has been brought out very beautifully by Sri Atmanandanatha (K.Ramesh) in the book “Lalitarnava Sudharasa”. 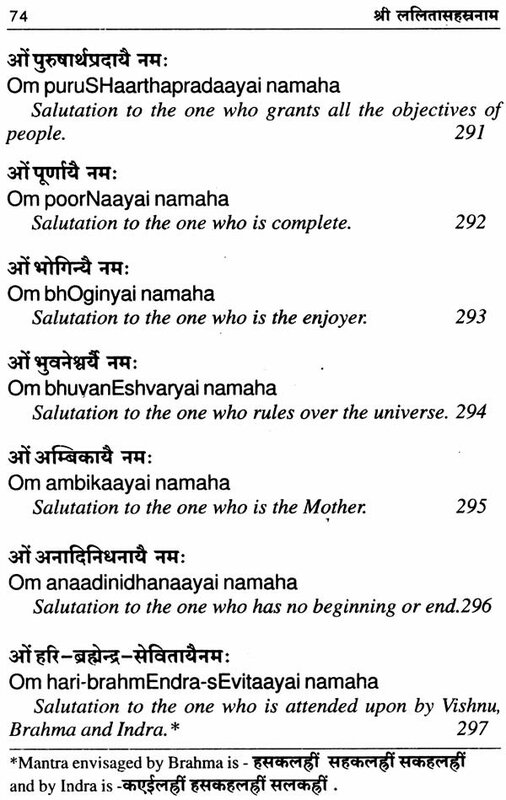 There are three divisions of the text- purvabhaga which gives the prelude to the composition and reception of the LS in 50 shlokas, the second is the enumeration of thousand namas in 183 shlokas and third in the Uttarabhaga which speaks of the greatness of its recital in 86 ½ shlokas. Not a single letter in LS is meaningless nor is an indeclinable such as ‘cha’ used for filling the metre. 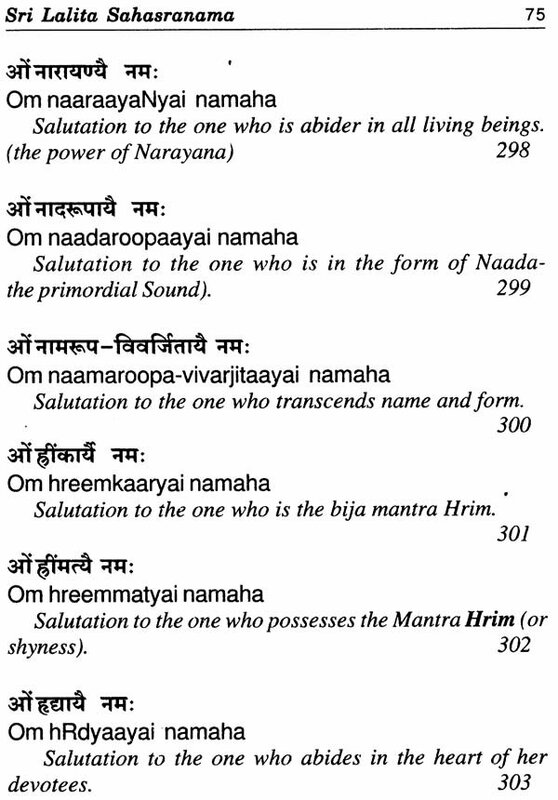 Of the thousand names, 72 namas consist of two letters, 142 namas with three letters, 282 namas with four letters,123 with five letters, 56 with six letters,2 with seven letters, 227 with eight letters, 7 with ten letters, 3 with twelve letters, 76 with sixteen letters. 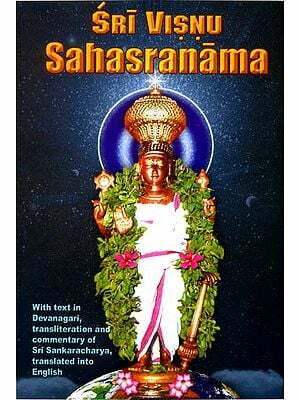 An attempt is made in this book to merely give a surface meaning of the sahasranama. In certain places however alternate meaning is given in brackets. 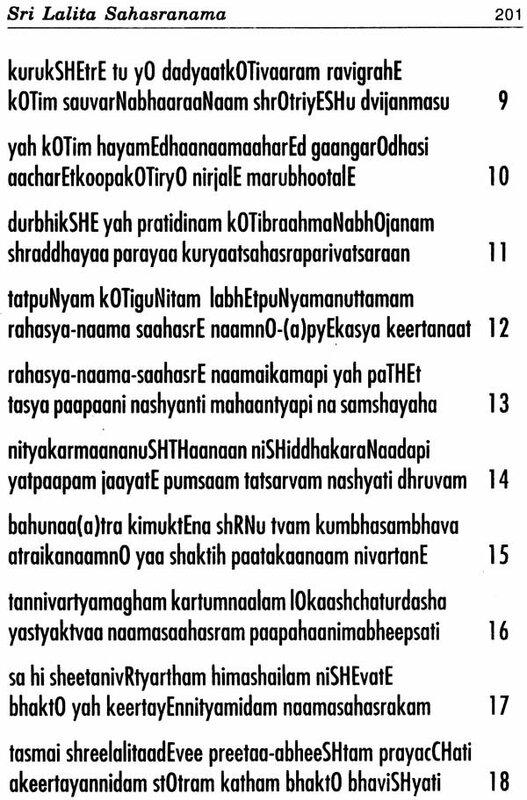 But one must remember that the depth of each nama is so immense that it would be humanely impossible to do justice to it. 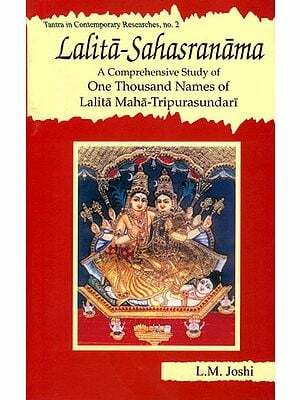 Few appendices have been added to understand the tantric aspect of LS, which we hope may serve as a useful tool for layman. 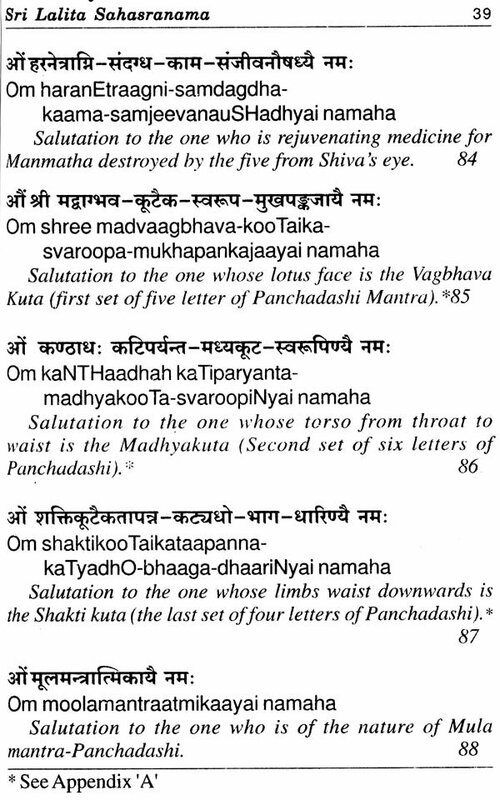 Also the various kinds of panchadashi mantra envisaged by different seers have been given in appropriate places. 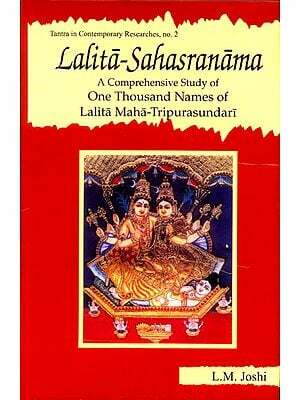 we hopes that by reciting the LS, the devotees reap the rich benefits espoused in the phalashruti and above all attain the Supreme grace of Mother Lalita, and be immersed in ocean of bliss like Bhagavan Hayagriva at the end of the recital.